Viruses and Xanthomonas spp., the causal agent of bacterial spot, are serious threats to pepper (Capsicum spp.) production in the USA. For decades, pepper growers have relied on host plant resistance as a first line of defense against these pathogens, and pepper breeders have deployed, cloned, and characterized a growing number of resistance genes. 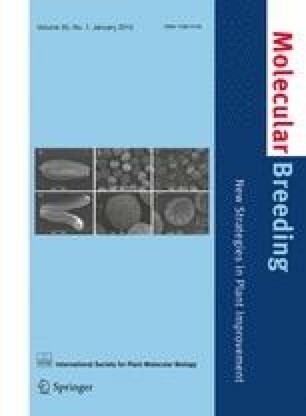 Molecular markers within or linked to these genes have facilitated rapid screening of breeding populations for resistance alleles relative to methods requiring pathogen inoculation. We have developed user-friendly markers in coding regions for the cloned pvr1 and Bs3 resistance genes using the Kompetitive Allele-Specific PCR (KASP) genotyping system in order to increase the robustness and throughput by which these loci are screened. The KASP markers are inexpensive, fast to process, and easily scored. An erratum to this article is available at http://dx.doi.org/10.1007/s11032-017-0631-y. We thank Bob Stall from the University of Florida for contributing seed of ‘ECW,’ ‘ECW10R,’ ‘ECW20R,’ ‘ECW30R,’ and ‘ECW123R’ and James Frantz and Molly Jahn for contributing seeds of the CC population. We thank John Murphy for supplying the PVY-NN inoculum and Samantha Klasfeld for laboratory assistance. We thank Mary Kreitinger and Lindsay Wyatt for thoughtful edits of this manuscript. Support for William Holdsworth was provided by USDA National Institute of Food and Agriculture Plant Breeding and Education Grant No. 2010-85117-20551.